I got interviewed last week by Karen from SpecialKknits. Karen has some lovely patterns for sale on Ravelry and her Waves of Love hat caught my eye. It's based on the rhythmic chinese wave stitch pattern and really makes hand dyed yarns come to life. I knit mine in JOY Precious Possum (Tanzanite). Super soft, lofty and oh so warm this hat was made for our family babysitter who is off to Dunedin for University. It's cold down there so I thought a warm hat might be appreciated. I modified the crown a little bit, doing the decreases twice as fast to try and get a more slouchier top. I also did the rib as single rather than double, mainly because the possum tends to behave a little bit like alpaca and I wasnt sure it would hold the rib. My model is a little bit smaller than the intended recipient but I think it still looks good. I love the way the colour variegations have pooled and the hat is so warm and dense. Im really happy with how this turned out, the pattern is nice and clear and makes for a nice relaxing knit. Karen is running a mystery mitts KAL on Ravelry during January http://www.ravelry.com/patterns/library/january-mystery-mitts Looks like a lot of fun! My turn to be interviewed! Karen from SpecialKknits asked me some questions about my designs and design process. You can read it here: http://specialkknits.blogspot.co.nz/ and be in to win one of my patterns for free! Today I am so excited to publish my very first designer interview! Faye from Ukeeknits was kind enough to answer some questions and share with us a sneak peek of her new design. Faye has been one of designers hard at work behind the scenes of the Ravelry Gift-Along and it has been awesome finding out more about her and her work. The impressively awesome Lumberjack pattern by Faye Kennington. Faye, you have some ‘instantly recognizable’ designs in your portfolio. Tell us how the Lumberjack and Sasquatch patterns came about, …. 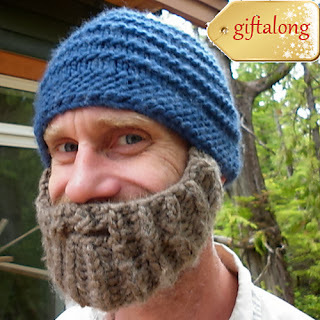 How DOES one come up with an idea like a beard hat? With media being so globalized, sometimes trends just seem to take off all over the place at once. If I see a trend developing that has a Pacific Northwest angle, I try to think of a knit interpretation. After binge watching Finding Bigfoot on Animal Planet, I published Sasquatch!. At about the same time, Annie Watts had a similarly themed pattern for the slippers Big Foot + Yeti, in the works. The world is being exposed to the same pop-culture references all the time, so even seemingly fringe ideas can influence a large group of people. Since Sasquatch! came out, Annie and I have been thinking about how we could collaborate. 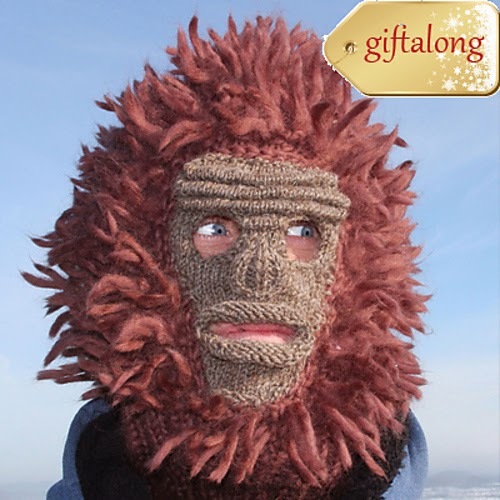 Right now and until December 8, 2013, when you buy Sasquatch! Balaclava pattern or Big Foot + Yeti slippers pattern from either of our Ravelry shops, you get the other pattern free. 2. Your designs aren’t all quirky and whimsical though…. What other things are you inspired to design? Tell us a little bit about your latest release - Volt Toque and Mitts. Do you have anything in the pipeline you can tell us about? I can tell you exactly how these “other” patterns develop – I fell in love with the yarn first! Like all good fiber lovers, when I go to an LYS and squish all the lovely yarn and see the amazing hand painted or kettle dyed rainbow of colours, I want them. So really, these designs justify the impulse purchases in my stash. Volt Toque and Volt Mitts were made from Manos del Uruguay Maxima. The “Highlighter” is insane and the “Foil” has such beautifully subtle nuances of tone it could bring a crafter to tears. I have 3 other accessory patterns to be released in December 2013 to complete the collection– Ampere Toque; Ampere Mitts and Watt Toque. Each pattern combines fluorescent and neutral coloured yarns with a short-carry stranded geometric design. When I get the idea to make a specific balaclava first, and then go looking for suitable yarn, I don’t get to pick the prettiest colours or smooshiest feel. Here is a sneak peek of Faye's soon to be released Ampere Toque and mitts. 3. Complete this sentence: Being part of the Indie Designer GAL has…. Introduced me to so many great knitters and got me more involved with a fantastic on-line community. My jumpstart in designing came from our local LYS when we had one. Ucluelet and Tofino are popular tourist destinations, so the owner and I worked together to create souvenir yarn-and-pattern kits with local themes for travelling knitters. Tuff Love and WhaleWatching Wellie Warmers were designed for these kits. The Pacific Rim National park and surrounding areas are so beautiful; I can’t help but be influenced by them. The trees on the sweater pattern Ucluelet are based on ones I pass by every day. Fortunately, no, I’ve never seen a real life Sasquatch, though the island does have reported sightings. I’d jump outta my skin if I didn’t have a heart attack first. 5. If you were stranded on a (cold) desert island and were allowed 3 knitting/yarn related things, what would you pack? That’s tough because I can’t think of any one skein that has enough yardage to knit an SOS sign visible from air. I guess I’d need to take that some of the Manos del Uruguay Maxima in Highlighter to try and catch the attention of a passing aircraft or freighter. I’d also need my favourite needle, a size 8 (5 mm) 40" (100 cm) Addi Turbo Lace circular. Lastly, get me the cutest, friendliest and fluffiest tobacco-coloured alpaca you can find. 6. What is your favourite colour jellybean? I can eat way more than my share of buttered popcorn flavour jelly bellies. They’re light creamy yellow with yellow spots. 7. Is there anything you would like to ask me about New Zealand? I keep seeing this The Hobbit: The Desolation of Smaug promo on the internet with a prize trip to New Zealand. The footage makes me wanna pack my bags right now! Since I probably won’t win, I guess I first need to know if I can stay at your place. Next, where’s the best place to get some yarn around there? In particular are there any farms or small-scale yarn producers that offer tours to the public? I’m a nerd like that when I travel. -----> Of course you can come and stay with me! I live in North of the North Island which isn't exactly the best climate for yarny crafts (it's often wet in winter and humid in summer) but there are a few yarn shops around. For a crafty road trip around the country check out Crafty Girls Road Trip. Come in August and we'll go to Knit August Nights in Napier. As well as being in a beautiful part of the country you'll get to indulge in crafty classes, yarn markets, factory tours and enjoy some down time with kiwi crafters from all over the country! PATTERN GIVEAWAY!! Faye is also working on a new fingerless mitt design and she is currently looking for some help naming this new pattern. Check it out in her Ravelry group!